Another personal favorite of mine to catch the -itis. 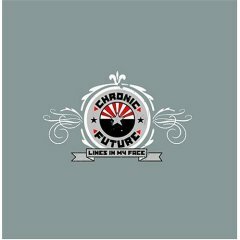 Chronic Future had one hit in the summer of 2004 with “Time and Time Again” but never sustained any type of popularity due to a terrible job of marketing, but more importantly, America’s growing taste for terrible music. I’m looking at you Beliebers. But Chronic Future holds a special place in my heart for speaking out in an era of uncertainty in my younger life. Back in 2005 there were rumblings of a military draft to support the growing wars in Iraq and Afghanistan. Most bands turned completely against government, military, and the troops. The usual wartime rumblings of abuse, babykillers, and torture circulated and they began calling these two plights my generation’s Vietnam. So, while yes I was terrified to see if our then-president was going to make a life decision for me, I felt that the soldiers in this conflict were getting the short end of the stick. Painted in a terrible public view, all while fighting “insurgents” with no real barometer for winning this war. So while the outlash against the establishment raged in the usual punk circles. Chronic Future took a different approach. These were our friends giving life and limb in a country exactly halfway across the world where they baked in the desert all while our national media and pop-culture turned on them. With songs like “Time and Time Again” and “Shellshocked” they reminded me that they were more than the average punk band. They had a unique way of saying what everyone felt. Saying what I felt but couldn’t verbalize. It’s still difficult for me to fathom. My respect for the people that make these sacrifices so you and I can go about our day like we always do. To be so against what they have to do, but support them for doing it. It’s a conundrum that gets lost on most people who just throw their friends, their family, into a group of soulless and heartless bastards because they carry a gun into someone else’s country. These are our friends, these are our family. These are other peoples’ friends, their family. They sacrifice years, limbs, life. Just so you can buy your coffee at Starbucks. Just so you can go shopping at the mall without the idea of it exploding ever entering your mind. This weekend is for them. For those that come back to us less than they were. Those that come back stronger than they were. They have made the sacrifices that make our country so great for so long. Do not forget to thank them for what they’ve done for you, even if you haven’t noticed. You haven’t noticed, because they’re doing their job. Happy Memorial Day everyone. Thank a troop this weekend.